This weekend, more than 150 Wharton alumni gathered to talk with us about business strategies for a better world. As part of Wharton Reunion Weekend, we were honored to host an alumni panel moderated by WSII Managing Director Sherryl Kuhlman, WG’01. The session—featuring panelists Abigail Bach, G’86 WG’86, Dawn Hines, WG’91, and Bill Lenihan, WG’96—highlighted some of the ways that Wharton grads are using their training, skills, experience, and network to create positive social impact. 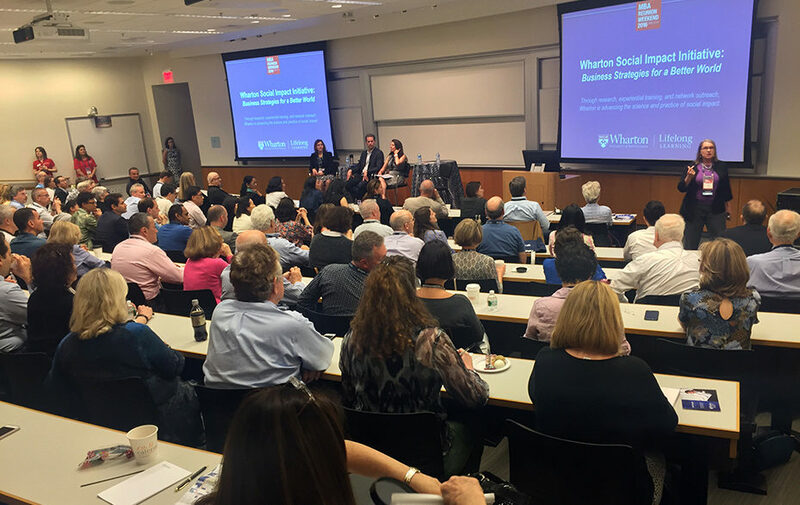 This standing-room-only event was the capstone on a busy and successful semester for Wharton Social Impact Initiative. This April, with Bridges Ventures we co-hosted the fifth annual MIINT competition finals, welcoming aspiring impact investors from 25 business schools across the world. The MIINT program grew this year to include more than 620 MBA and graduate students enrolled—the largest pool yet. In advance of the President’s Innovation Prize and the Engagement Prize announcements, we worked to guide aspiring entrepreneurs with a series of how-to blog posts during Impact Entrepreneurship Week. This coincided with the release of a report on innovative finance, created with the support of the Rockefeller Foundation. In May Stephanie Kim spoke on a panel on the role of business school students in underserved communities, at a conference organized by the Foster School of Business at the University of Washington. Harry Douglas and Nick Ashburn were asked to join an OECD Expert meeting in Berlin to discuss impact investing research, and Jacob Gray was invited to speak on the same topic to 500 Merrill Lynch private wealth financial advisors in Miami in June. And finally, we had the privilege to host an end-of-semester gathering to celebrate the many students who’ve worked with us across this year. This year, we worked with 74 Social Impact Fellows from across the university—including students from Wharton’s undergraduate, MBA, and Executive MBA programs; SAS, Engineering, Fels, Med, Law, GSE! WSII’s Vice Dean for Social Impact, Professor Katherine Klein, won the Excellence in Teaching Award for the Undergraduate Division. This award is given to 10 faculty members to recognize curricular innovation, integration of material across courses, innovative use of technology within the classroom and exceptional devotion to students. For his exemplary customer service, resourcefulness and creativity, Team Coordinator S. Tyler Hoffman received the Pillars of Excellence Honorable Mention at the university-wide Models of Excellence award ceremony in April. 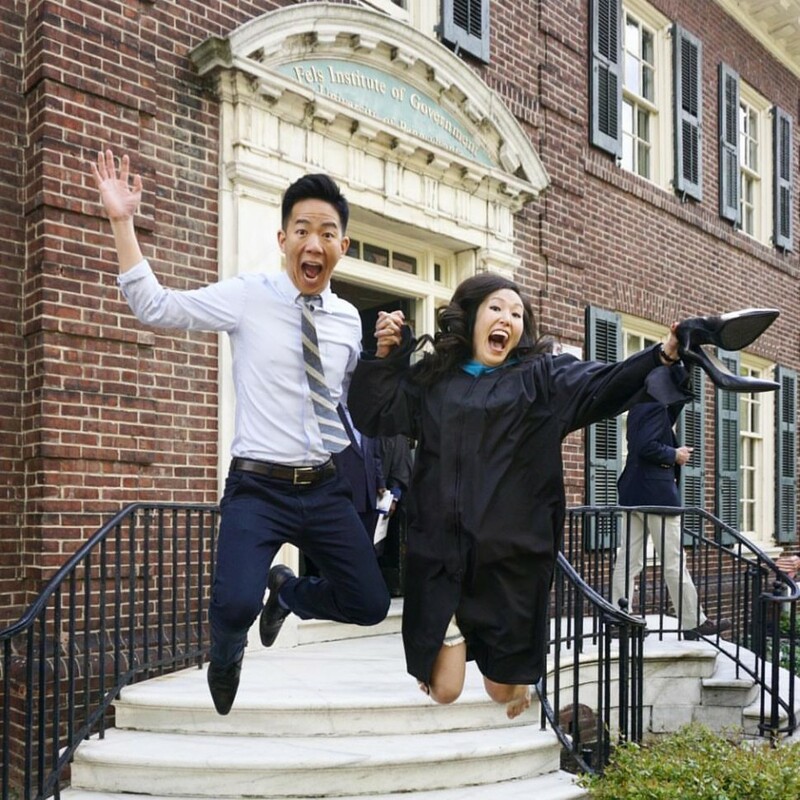 Stephanie Kim, Associate Director for Community Strategy, graduated from the two-year Executive Master in Public Administration program from Penn’s Fels Institute of Government. In addition to her MPA, she received a graduation award for institutional service. Stephanie also spent the spring semester co-teaching URBS 219 ” Heart of Social Change” to 25 undergrads across Penn, with University Chaplains Charles Howard and Steve Kocher. Harry Douglas, formerly an impact investing associate, is WSII’s new Director of Impact Investing Research. He is the co-author of “Great Expectations. In his new position, he focuses on creating data-driven insights into the impact investing industry. Keep in touch with us over the summer by subscribing to the monthly social impact newsletter and following us on Twitter and Facebook.